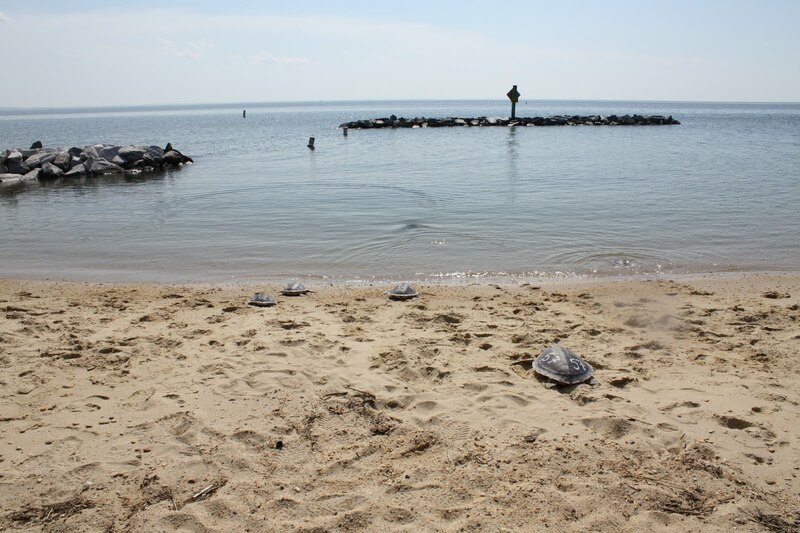 This week was exciting for our sea turtles at the Animal Care Center. It was time for another release! 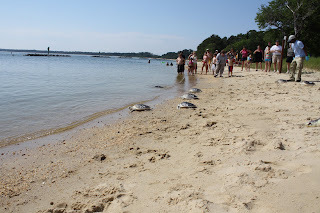 The water temperature still isn't warm enough up this way, so we decided to drive 12 of our Kemp's ridley sea turtles and 3 Kemp's ridleys from University of New England Marine Animal Rehabilitation Center (MARC) down to Maryland for release. Dr. Michele Sims, a veterinarian for MARC, was my driving partner for this trip. 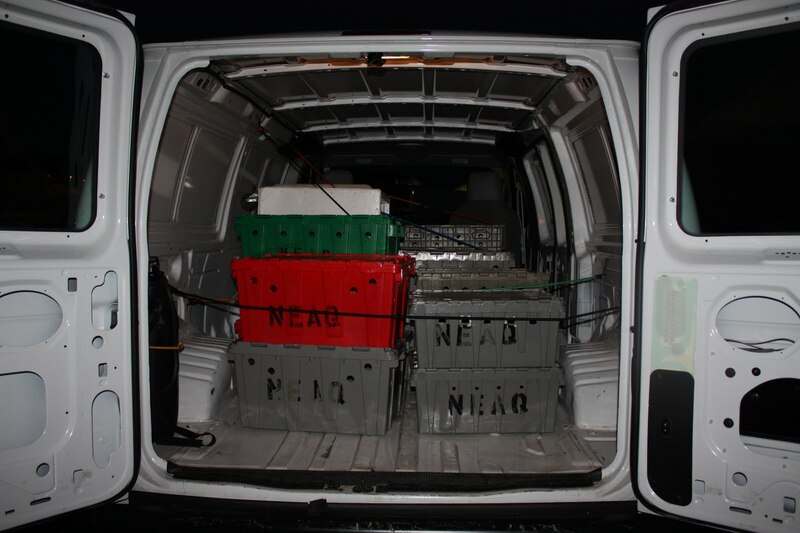 We met in Quincy on Friday morning (at the lovely hour of 4am) along with NEAq volunteer Erin to pack up the turtles in a van. 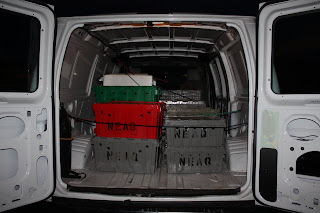 Once the turtles were sercured in the van, Michele and I began our journey south. 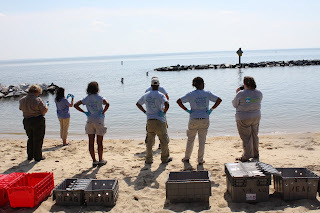 Our first stop was to meet stranding coordinator Jen Dittmar and interns from the National Aquarium in Baltimore (NAIB). 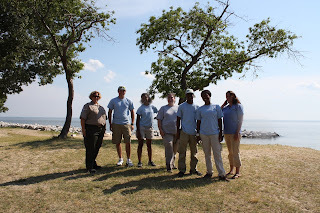 We met up with them in Baltimore and caravanned another couple hours down to the release site at Point Lookout State Park in Scotland, MD. 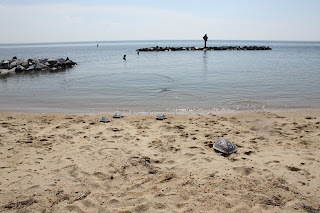 Ther park was a great place to release the turtles right into the Chesapeake Bay, where there is a known forageing ground for Kemp's ridley sea turtles. 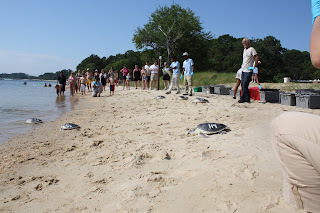 Once we arrived at the release site, we lined up the turtle boxes on the beach. It was a prefect day for a release and some lucky beach goers got a nice surprise to their day. NAIB interns and staff from Point Lookout State Park assisted Michele and me with placing the turtles on the beach. 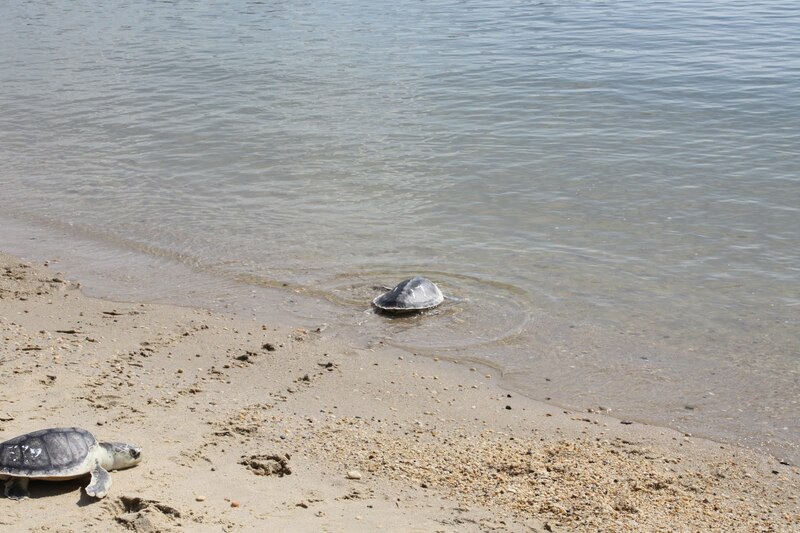 It was great to seem them race into the bay! 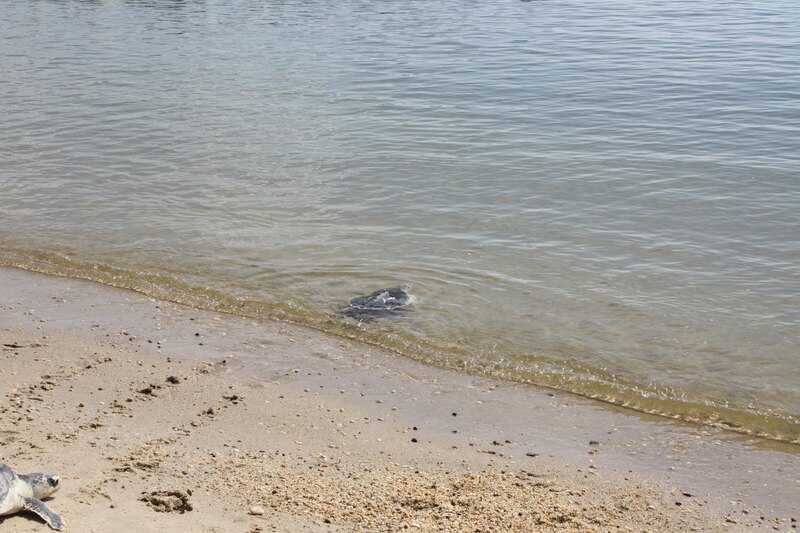 The turtles wasted no time getting to the water. Look at those ripples as they spead away from us! 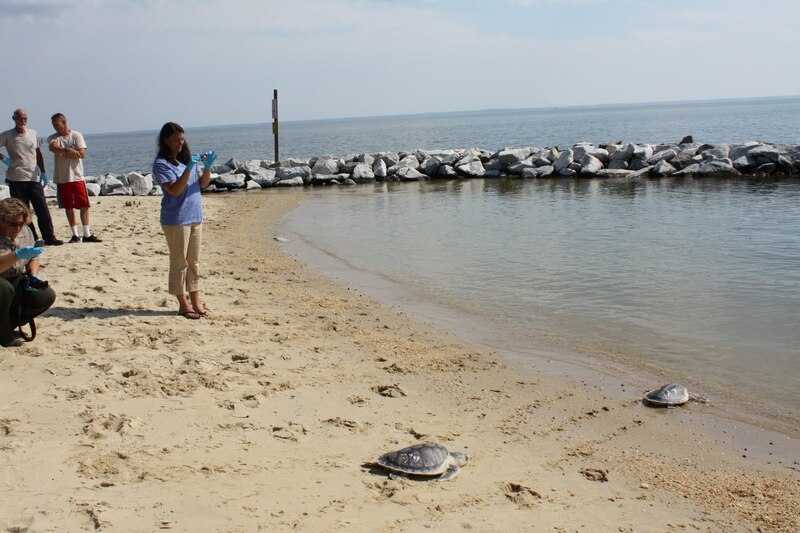 Above, Dr. Michele Sims photographs the last turtles entering the water. 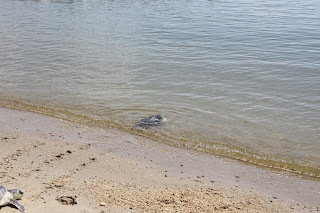 'Pleiades' (#17) was the last turtle I placed on the beach. He raced past #79 (who finally got the hint watching him pass) and headed straight for the water as you can see in the above photos. You can read about #17's battle with pneumonia here. Other turtles you may remember from previous posts that were released include 'Quasar' (#69) and 'Barringer' (#06). 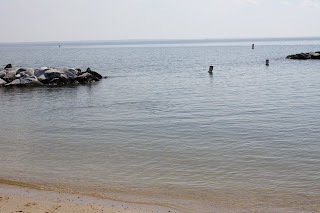 It was definitely a great sight to watch them swim out into the bay. What a great day! A special thanks to Jen Dittmar from NAIB and the Point Look State Park rangers for all their assistance in coordinating this release. Also thank you to the NAIB interns for assisting in the actual release and Dr. Michele Sims for being my driving buddy and release partner.